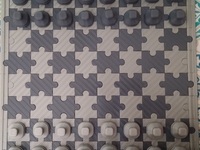 Zeycus' Abstract Chess Set by zeycus is licensed under the Creative Commons - Attribution - Non-Commercial license. 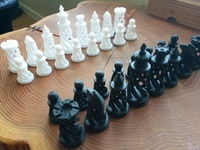 Chess set I designed in 2001, originally in PovRay. Recently used Openscad to create the STL file. It seems the size of the pawn uploaded is does not fit the previous proportions. LAST UPDATE: Upload the new version of the king, with a shortened cross. It corresponds with the pictures taken. Say thanks by giving zeycus a tip and help them continue to share amazing Things with the Thingiverse community. Say thanks and help zeycus continue to share amazing Things with the Thingiverse community. You'll need a PayPal account to tip zeycus. Click the button below and you will be redirected to PayPal. 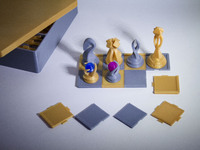 Once the payment is complete, you'll be brought back to Thingiverse.